As previously posted, I displayed all my marathon medals. In cleaning out the basement I discovered my remaining marathon medals (as well as just about every other medal I've ever won). 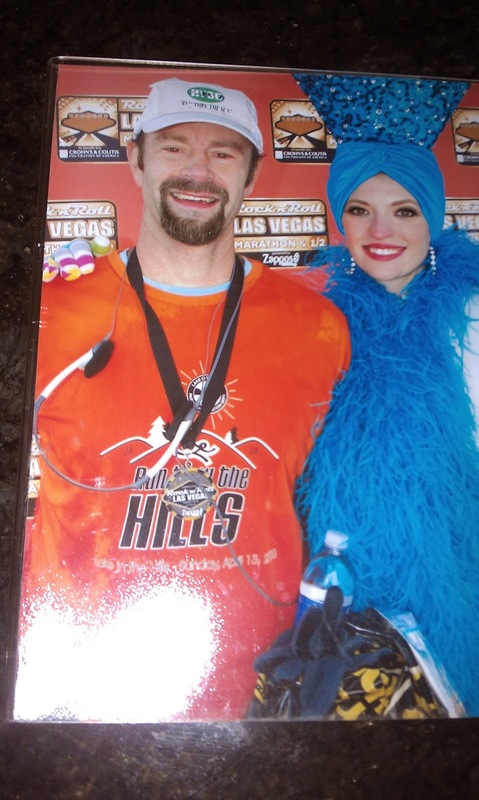 In 2009 I ran the Inaugural Las Vegas Marathon put on by the Competitor Group (in previous years the marathon had been run by Devine Racing). I had heard stories from other runners who had run it and I wanted to take part in it. Plus it was a flimsy excuse to go to Vegas. The 2009 race was my first marathon ever and I remember it was so cold that their was a thin layer of ice over the cups of Gatorade at each of the water stops. This was before they went to the night races. 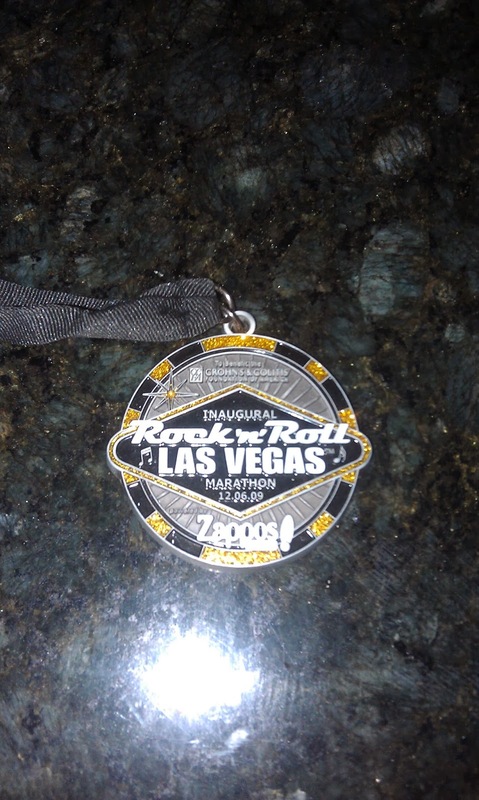 The race started at 7AM (I think) when it was still dark, so I did experience a bit of running down the Vegas strip in a dark atmosphere. I distinctly remember the day before the marathon I was extremely nervous and had a hard time eating anything. I pretty much camped out at the Luxor sports book and watched college football all day. Occasionally another runner would sit next to me and I'd get encouragement that I would do okay. All I had to do was lace up and race the pace I had trained for. I didn't want to spend a second more on my feet than I had to on account I was terrified of wasting energy. While I had done the training for the marathon, I was 100% solo and was just worried about what would happen after 20 miles. Would I crash and burn and be walking the final 6 miles? Did I have what it took to run all 26 miles? My goal for the first marathon was to simply finish as well as hit about a 3:30. Easier said than done, I suppose as I wound up finishing in 3:41. I wound up running the first half in about 1:40 and while that was an easy pace, at the time for me, I wasn't feeling it and felt my pace start to decline fairly quickly after mile 14. I suspect that I paid the price for going out just a smidge too fast in those early miles. Initially I was going to run 8:15's or 8:30s but I accidentally hit a number of 7:45's. I was 100% rested and it was easy for me to go faster than I wanted to. Even 30 seconds faster a mile will cause you to pay the price later. Finishing my first marathon was nothing short of a religious experience. People will tell you that running a marathon will change your life: it will. I know around mile 20 I was cursing my decision to run but by mile 26.2 I was, "When's the next race?" I've attached a photo of me standing next to one of the Vegas girls. It is one of the few race photos I've purchased and I wish the Competitor Group would go back to giving you the opportunity to take a post race photo with these girls. Also the Monday after the race I went to see the Rat Pack is Pack at the Plaza Hotel. This is one of the best pictures I ever took and also this was the best show I've seen in Vegas (and I've seen a bunch). For about $30 I got a good meal and a good show. 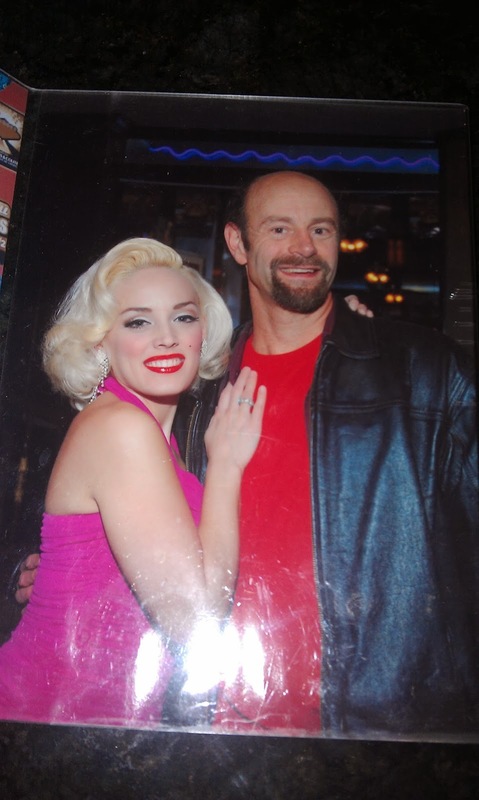 It was also the first time I spent any significant time on Freemont Street despite going to Vegas several dozen times prior to that. I also met a wonderful couple in line while waiting for the show. Even after all this time we still keep in touch. The 2010 race was just as good. It was pretty much the same course (with some variation) and I wound up running it a hair faster than my inaugural marathon. 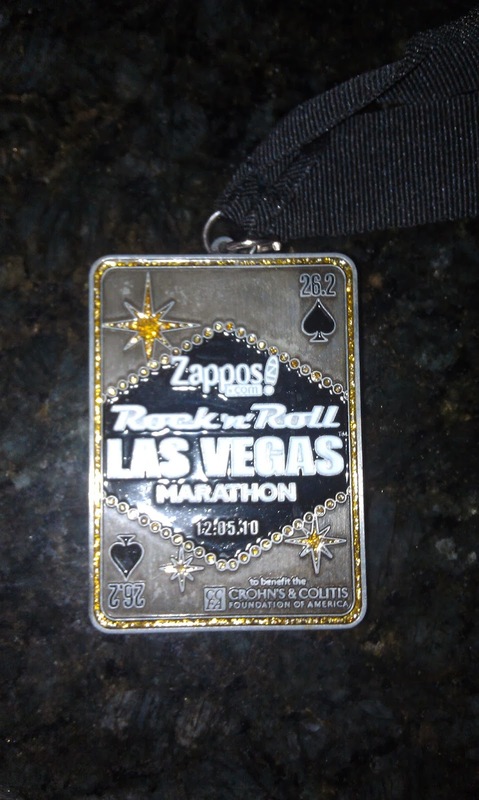 As long as I am able to, I'll keep the tradition going and run the Vegas Marathon. It is always fun and its a good excuse to hit up Vegas for a long weekend.